This volume of Interventional Cardiology Clinics will have two parts. 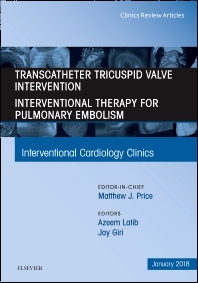 Part I will cover Transcatheter Tricuspid Valve Intervention and be edited by Dr. Azeem Latib. Part II will focus on Interventional Therapy for Pulmonary Embolism, with editorial direction from Dr. Jay Giri. Topics covered in Part I include: Interventional Imaging of the Tricuspid Valve; Percutaneous Tricuspid Annuloplasty; Tricuspid Spacers; Caval valve implantation; and Transcatheter Tricuspid Valve Replacement. Articles in Part II include, but are not limited to: Systemic Thrombolysis for Pulmonary Embolism; Catheter-Based Embolectomy for Acute Pulmonary Embolism; Mechanical Hemodynamic Support for Acute Pulmonary Embolism; Caval Filters: Current and Future Concepts; and Balloon Pulmonary Angioplasty for Chronic Thromboembolic Pulmonary Hypertension.